Near Field Communication (NFC) is one of the coolest technologies that hardly anyone uses. Such a small chip and so many uses! The technology is an almost undiscovered playground. Here are what is possible and its technological advancements. NFC was invented in Austria – at NXP in Gratkorn near Graz (formerly known as Philips Semiconductors and even before that Micron). The technology has existed for more than ten years but has really spread only in the last five years. The wireless technology used can exchange small amounts of data between active and passive or two active participants. One of the main applications of NFC is small amount payments, such as with all debit cards in Austria (recognizable by the inscription “PayPass”). Furthermore, most modern smartphones, except for the iPhone, come equipped with the NFC technology as well. 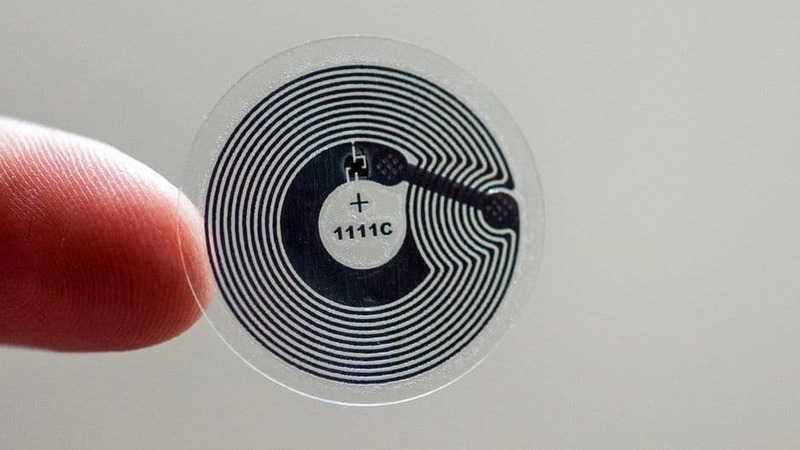 A passive NFC tag (as seen on the image below) consists of a tiny chip and a comparatively large antenna surrounding it. If an NFC-enabled smartphone comes within millimeters of a tag, the energy emitted by the smartphone awakens the chip, which reveals the information stored in it. The information, which is usually only a few bytes long, may contain contact information, website addresses, device settings, short texts, etc. Where and how is Near Field Communication used? Most commonly the NFC technology is used for smaller payments, up to 25 euro, or other card systems (e.g. ski cards etc.). With the integration of NFC in smartphones, the exchange of data is to be achieved. If you have a website, a photo or a YouTube video, contact information or a certain calendar entry open, you just need to hold two smartphones together, back-to-back and have the relevant file open on the sending phone. Just like that the content is already being transferred. But: NFC only launches the transfer, the actual transmission takes place via WLAN or the phone network. It can also be useful when trying to refer a friend to a certain application – simply open it and hold the phones together. This will trigger the relevant app being opened in the Google Play Store. 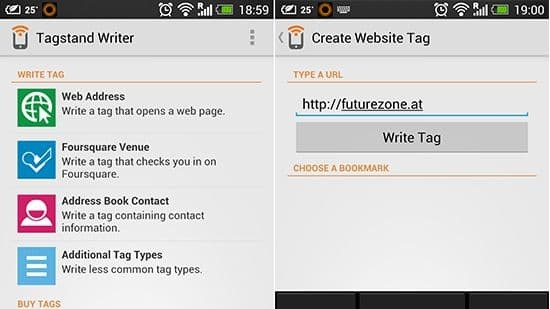 In xamoom NFC tags (besides QR, GPS, and Beacons) are used as location identifiers. When scanned by a user, the system will be given the location of the tag and deliver the location-relevant information. Depending on the purpose for which they are intended, there are different tag models. If the chip is to be mounted on a metal surface, the tag must be protected with a special cover to be shielded from metal. Of course, there are also different models which differ in storage size and scan performance. In this case, it is necessary to consider what the requirements are for the specific application. The most commonly used are the so-called NTAG203, as well as its successors NTAG213 and NTAG216. They differ mostly in their memory size and scanning performance (maximum distance from the tag). In addition, the newer generation, NTAG21x, have the option of password protection. This protection is intended for simple encryption of data. If a higher level of security is necessary to ensure system-wide security, special NFC-tags that offer cryptography methods can be used. All NFC tags can also be write-protected, in order to prevent jokers from overwriting them with unwanted web addresses. 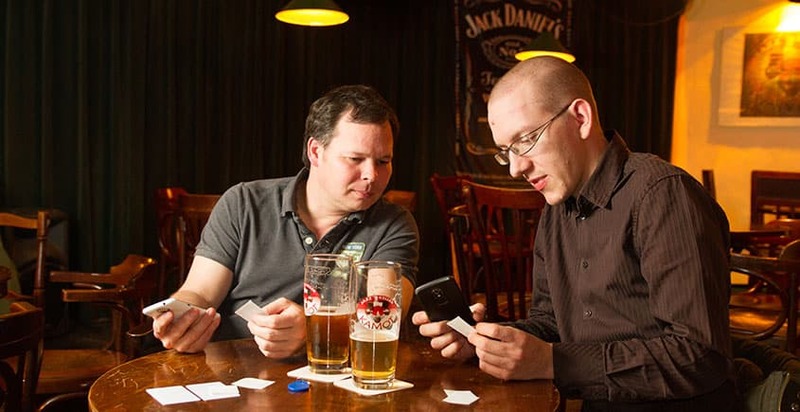 All NFC tags that come from xamoom – with the exception of the demo systems and our business cards (those can be played around with) – are made read-only. How is the NFC encoded? Desired data first needs to be encoded or written onto the NFC tag. This can be done with an app and an NFC-enabled mobile phone. For Android phones, we recommend either the xamoom Service app, the TagWriter app developed by NXP or the NFC Writer by Tagstand. If there are different tags that need to be written with different links (or other datasets), it is worth to use the xamoom Service app. With the help of this app different URLs can be read directly from a .csv file. In case of having many tags waiting to be encoded, there is also a USB writer that is available for purchase. A device costs about 40 Euro at Amazon and the best software comes from GoToTags.com. This device will make the writing of tags way easier and faster directly from a computer. an NFC reader, which is connected to the PC. This enables easier and faster writing of tags and the ability to use Excel and .xml files. The best software to use for this purpose is GoToTags. You can find lots of great applications and uses on the NFC-Hacking on the XDA Developers forum. The many options make one thing clear: NFC adds value and simply needs to be tried – not only when paying with a debit card but for lots of other applications as well. In order to get the big crowd however, Apple needs to “jump on the train” and show support and implementation of NFC as well. What would also help: easy access to NFC tags. Although you can get them on Amazon or Rapid NFC, they are not commercially available. Even the Android manufacturers could provide and package a few fresh empty tags to their sold devices. Bruno and Georg found the technology so great that they once even talked about it over a beer (in reality, there were a few too many). In former “Jazzkeller Kamot” they pondered what all one could do with an NFC. And then the idea was born, to make a huge public library in open space out of Klagenfurt – a city without a municipal library. Projekt Ingeborg was born and that led on to the birth of the mobile information system of xamoom.